Milwaukee Public Radio, WUWM, is home to one of my favorite radio programs, Lake Effect. 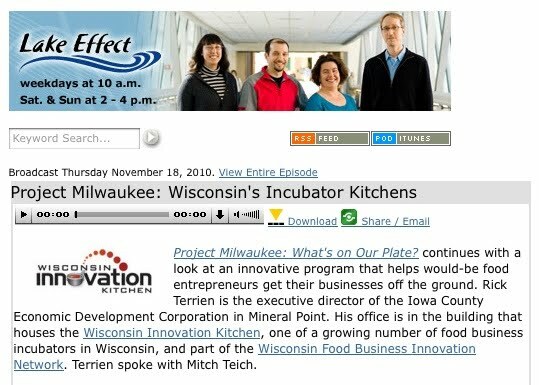 I had a chance recently to talk with their producer Mitch Teich about the Wisconsin Innovation Kitchen. The link to their audio archive of this conversation is below. From the show's intro: "More that 350,000 jobs in Wisconsin - about 10% of the state's workforce - depends in some way on agriculture. But for people who aspire to starting their own food related business the challenges can be daunting. Issues such as developing a business plan, obtaining the raw materials, and acquiring the proper licenses to process and sell food products can deter or derail a would-be entrepreneur... One pioneering facility is the Wisconsin Innovation Kitchen."